Like all products, asphalt shingles have advantages and disadvantages for home improvement. However, unlike all other home remodeling projects, a new asphalt shingle roof provides the most bang for your buck in terms of returned value over the short term (read as in the next decade). In this guide, we’ll explain what makes for a fully installed shingled roof, how it gets done, but perhaps most importantly how you can be squarely involved in the selection process for all materials. Nearly a century and a half ago, asphalt type roofing didn’t exist. So in short order, this product went from new kid on the block to number one way people in North America cover their homes. Really, it’s more like 1901 as the first implementation of asphalt shingles and roughly 40 years later is when hundreds of millions of feet of the product were being produced. Since the mid 1900’s, asphalt shingles have maintained popularity and made minor changes to keep up with an ever evolving roofing market. How popular are asphalt shingles? It’s estimated that 75% of all homes in the U.S. are covered with some version of them. The industry generates over $10 billion in revenue annually and yet contributes over 20 billion pounds of waste each year. Their ongoing mass production though does have the significant benefit of being able to obtain bundles of the product at a price that no other roofing material can match. And because the skill set, along with the tools needed for installation are relatively low, the DIY route is more plausible with this product than most other types of roofing materials. Still, unless you are a professional contractor, the knowledge of what product to select may seem too challenging to go the DIY path. Fortunately retail outlets such as Home Depot and Lowe’s do everything they can to make the process as easy as possible. 😉 Our goal is to help you along that path. The basics of a traditional asphalt shingle are: cloth-like paper or fiberglass mat as a base material, with asphalt layer on top of the base as the primary material, followed with a coat of granules (made of composite materials). The cloth-like paper base is the more traditional and today, the less-used type of shingle. 90% of all shingles today are made with the fiberglass as the base material. The two most popular types are 3-tab and architectural, also known as laminated asphalt shingles. In terms of selecting an asphalt roof, this is likely the first consideration. Take a look at this page on RoofingCalc to understand the differences between the two. Essentially one (3 tab) has a more uniform, and flat appearance, while the other (laminate) has greater variety and a 3D-like appearance. Note: Roof deck, or plywood sheathing is the assumed base layer. Unless building a brand new home, it is likely this is the base layer for all roofing structures. Leak barrier / underlayment material / flashing – is first layer, or first 2 layers. These are designed to prevent leaks if shingles are not working properly, and guard against moisture build up. Flashing is last part of this step and is placed on joints or intersecting roof planes to direct water away from areas where it may otherwise get trapped. Starter shingles – are layer applied to part of a roof, usually around eaves or lowest portion of a sloped roof, to ensure water flowing over shingles is falling away from the home rather than getting stuck along roof edges. Asphalt shingle layer is the next, and obviously most prominent layer. Then a ridge vent is installed, but only if there are already soffit vents in place. This is an optional step, but is generally recommended to ensure better cooling of an attic space across the top length of the structure. Finally, ridge shingles/caps are added to cap off the vent and maintain the aesthetic appearance of shingles along the ridge. The overall costs for these items are relatively inexpensive. Compared to other types of roofing (stone, metal, wood) they cost far less, and normally don’t require special tools. Hammer and nails (or fasteners) are the primary tools of the trade, but there are other items (i.e. cutting tools, tape measure, ladder) that you learn to use in the project. Both Home Depot and Lowe’s provide information for what’s involved in installing a roof. A professional contractor will have experience doing this type of job, and with experience comes level of expertise. This saves time, but does cost additional money for their labor. As a very rough estimate, basic roofing materials, minus labor, for a moderate sized home are around $2,500. If part of the job is a tear off of older layer(s), this adds to the labor time or cost. Assuming that is needed, and a professional, insured and bonded contractor is involved, you can plan on spending another $1800 to $2500 for labor. roof layout / pitch – more skills are needed for working on roofs with intersecting slopes. Pitch refers to how steep the slope is, which may vary over roof with multiple sloping panels. Generally the steeper the roof, the more time, material and skill is needed for a roof installation. The last item, where you live, makes it very challenging to provide a one price fits all type of quote. It can vary greatly by region, but still an average price is known. Take a look at this page on RoofingCalc.com to get an idea of price for installing an asphalt shingle roof by a contractor. While square footage is the common way to measure most surfaces for home improvement, roofing uses a measurement called a “square” which equals 100 square feet. The average residential roof is 1600 sq. ft. or 16 squares. Asphalt shingles are generally sold by the bundle, and typically 3 bundles will cover a square. Generally, assume one full square beyond what you determine is the number of squares on your roof. Waste is likely for less experienced roofers, and even pros count on waste being part of any project. Whatever is left over is product that can be used if shingles become loose or need replacing at a later date. Standard nailing is 4 fasteners per shingle, or as many as 6 if your home is in a high wind area. Asphalt roofs last 15 to 30 years before a new layer, or a tear-off is called for the new installation. related to this last point is using cheaper shingles or cheaper accessories. A great deal on a lesser known brand name of shingles may seem too good to pass up, but it’s a huge gamble to take, if it leads to any of the problems below. Established brands have a history of testing against such issues. hail damage is one of the worst weather events that can do immediate damage to a roof. Many models of today’s shingles note what size of hail the shingle can tolerate. If a hail storm blows through with larger than that size, it would be helpful for long term maintenance to check the roof for possible repair/shingle replacement. change in extreme temperatures. Asphalt shingles can tolerate cool and warm weather, but climates that can get really hot and also really cold, can lead to cracking of shingles over time as the material doesn’t readily expand or contract with extreme changes in temperatures. related to the last point, wind is always a factor with asphalt shingles, but especially if it is bitter cold out and there is heavy wind. Because this generally means there is ice or snow on the roof, it is not a good time to check on the roof, unless it is deemed an emergency (significant leak in the roof) and a professional is the one checking it. More often than not, it can wait until spring thaw to check what, if any damage an extreme winter had on your roof. sunlight damage – This takes a long time to play out, and is not the same factor as heat, though the two tend to go hand in hand. One of the reasons why asphalt shingles have granules on the surface is specifically to protect from UV rays and how that will rapidly wear down an asphalt shingle. The granules provide an extra layer that resists other types of damage, yet are subject to same forms of damage themselves. Granules can blow loose, or wash off, or gradually wear away, but that takes years on most products today. At least 7 years and up to 25 years is not unheard of. Once a roof is at the point of exposing bare asphalt, it’s time to start budgeting for a new roof, or new layer of asphalt shingles. attic ventilation issues can lead to damaged shingles. Asphalt shingles are great for trapping heat below them, but poor for ventilating to ensure cool air flow. Hence the need, or recommendation, for roof and ridge vents. — These words of caution aren’t meant to scare you away from the DIY approach. Just caveats that relate to disadvantages of asphalt shingles. A metal roof is going to be more energy efficient than an asphalt shingle roof. Natural stone (slate) and tile roofs are a lot less susceptible to wind damage than asphalt shingle roofs. But both those options come with a price and have their own disadvantages. So, before we move onto the next section and how to select products, let’s just touch on the positives, or advantages, of choosing an asphalt shingle roof. Low cost and ease of installation are near the top. — This is likely reason #1 why this roofing material remains at the top of all materials. Very versatile. Lots of colors and shapes, but we’ll speak more to this in the next section While other materials may be more durable, they tend to be more rigid. Asphalt shingles work on pretty much any type of surface and need no special cutting tools to make them fit where they need to fit. With a stone roof, walking on it can lead to damage. Not the case with an asphalt shingle roof. 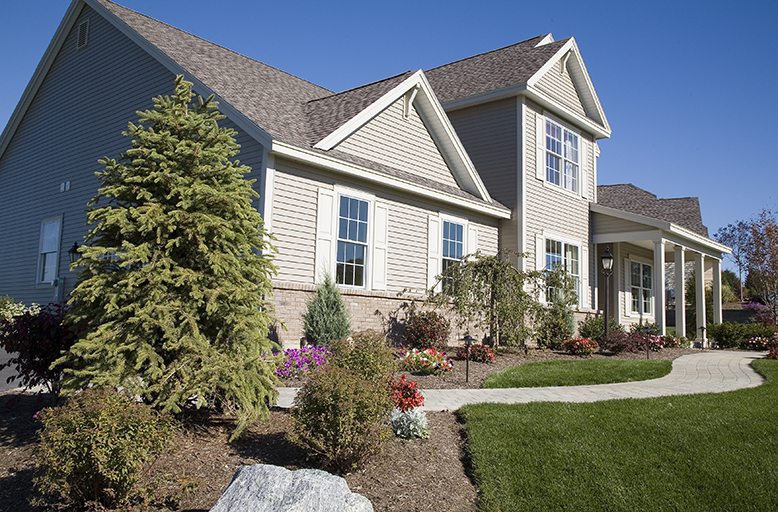 Steep slopes or shallow slopes (that have at least a 3:12 pitch), asphalt shingles work well on all of them. Very low maintenance. Actually, close to none. Periodic checks are recommended, but generally in the first 5 to 10 years this means no work needed to ensure full life span. So, you or a pro goes up and checks, at most twice a year, to see if shingles need replacing or if flashing is showing any weak points. Sometimes, in more humid climates, moss may build up on a roof, and a cleansing is needed for that (mixture of bleach and water usually works). But realistically, there is no annual task to do other than a check-up. If asphalt roofs were leading to annual damage on even a small amount of homes, such data would be well known and seen as huge disadvantage of the product. Instead, asphalt shingle is a low maintenance, inexpensive roofing material that tends to hold up very well to weather elements for a good 15 years, or as much as 30 years. Typically 17 to 25 years is the time when replacement occurs.